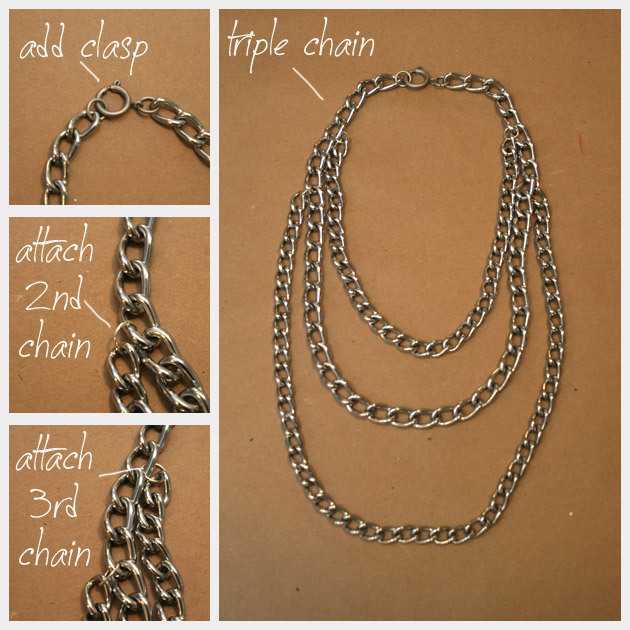 This Triple Chain Statement Necklace DIY is sure to be your go to necklace this Fall. Statement necklaces are everywhere, and if youre like me youre always on the lookout for another great one. I will be wearing this triple chain statement necklace with everything! The first thing you will need to do is to cut your chains. Deciding the lengths of your chains, its really what comfortable for you. I used the dog collar as my middle chain and only cut the 2 end links off to remove the large rings. Then I cut the dog leash into 2 pieces for the top and bottom chains. I cut the top chain 12 inches. I cut the bottom chain 18.5 inches. If you are using chain dog collars and leashes for this project, let me just tell you, the links can be opened but not easily. But if I did it, I know you can too! This is where I recommend using the vice grip pliers (so you can get a good grip on the link) and a pair of heavy duty needle nose pliers (you will use these for leverage). 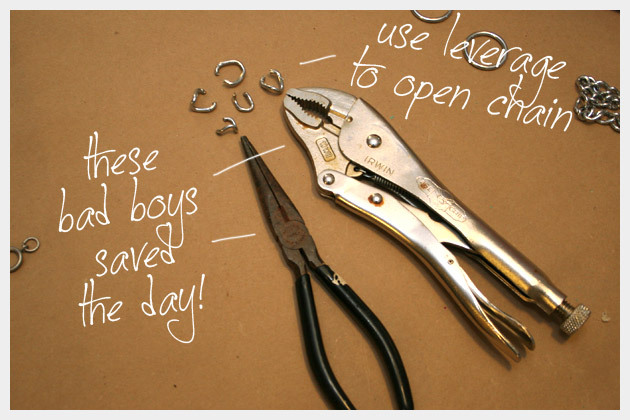 What I did was; using the vice grips, I attached them to one side of the link I wanted to open and lock them in place. Then using your heavy duty needle nose pliers, slide the pointy end into the link and (make sure you are standing or able to put all your force on them) push down and push the end of your needle nose pliers towards and against the vice grips and at the same time, push the handles away from each other. If you wedge the needle nose pliers in far enough and can press them against the vice grips, the link will actually break quite easily. Once I figured out how to do it, it went quite quickly. I also recommend placing a towel or something underneath the tools when you are working. Especially if you are like me, working on the kitchen table! 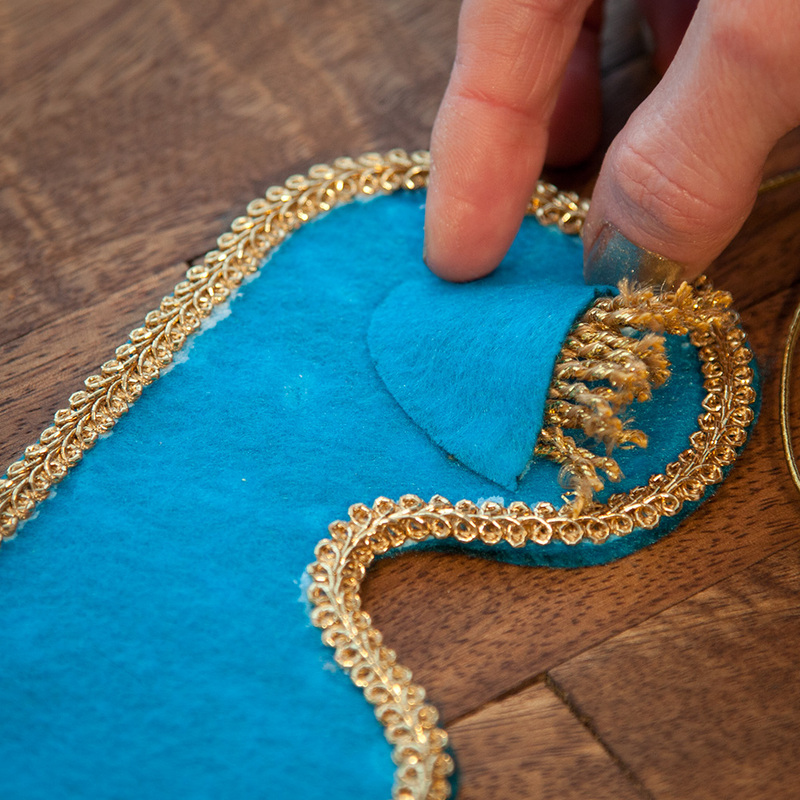 Once all your chains are cut, take your necklace closure and attach it to the ends of your middle chain. 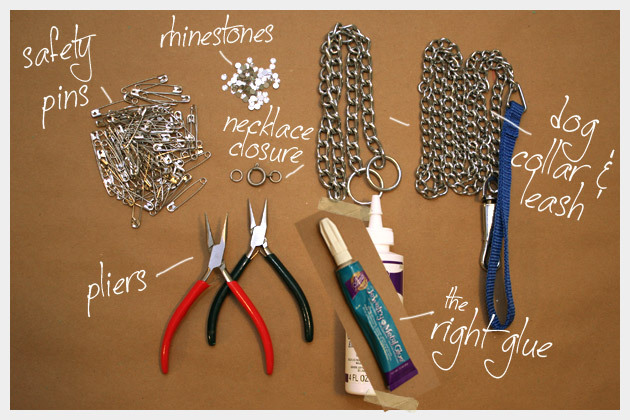 Use your pliers open the jump rings on the necklace closure and attach them to the ends of your chain. Now you will attach your top and bottom chains to your middle chain using your jump rings. I attached my top chain to the middle chain at the 5th link down from the ends on each side. And I attached my bottom chain to the middle chain at the 8th link down from the ends on each side. Now your 3 chains are all attached and youre ready to add your safety pins. I recommend gluing your rhinestones to your safety pins before you attach them to your necklace. 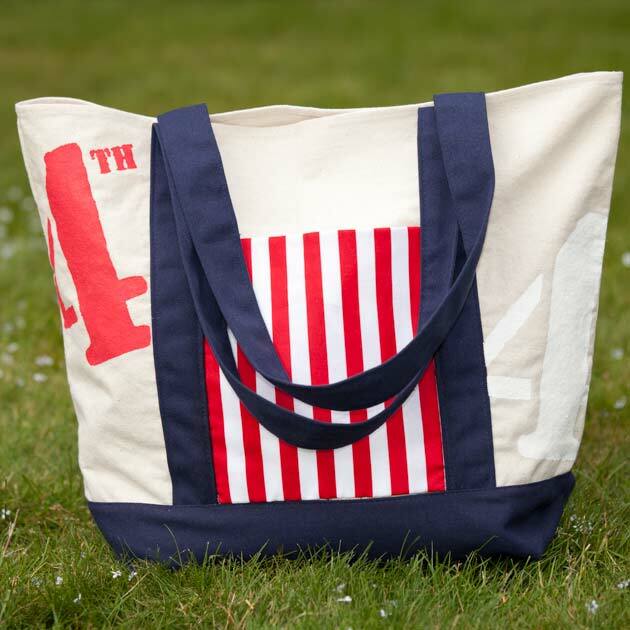 However, you will need to decide how many safety pins you will need first and where you will be placing them. I did mine a little backwards, I put all the safety pins on the necklace first to see how many I would need and the placement. Then I took them off and glued the rhinestones to them before reattaching them to the necklace. I also left one on each chain of the necklace so I would know where to place them. So, that said, lay all your safety pins out on a table and place a small amount of your glue on the hinge end of your safety pins and add one rhinestone to each. 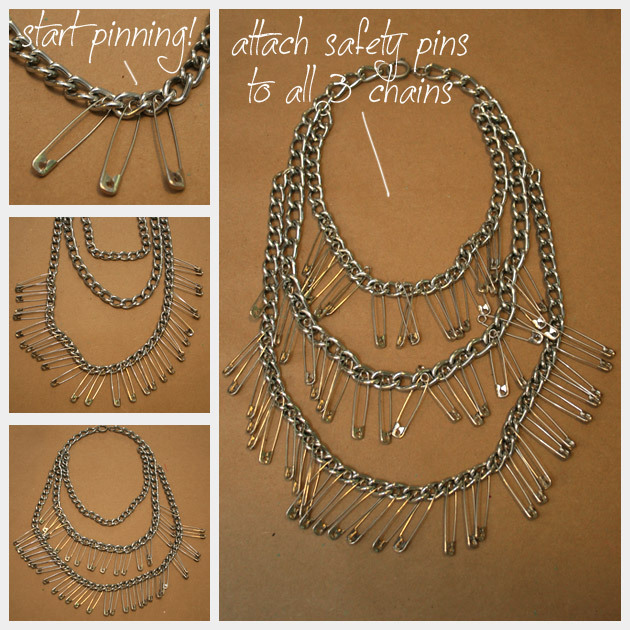 Once all your safety pins are dry you can attach them to your necklace. 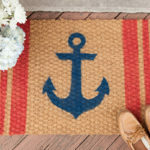 I realize this is a bit of a long winded tutorial, however its actually quite a simple DIY project. I have to say, this is my new favorite statement necklace. Seriously! It feels substantial from the weight of the chains and the rhinestones add just enough sparkle, without being over the top. 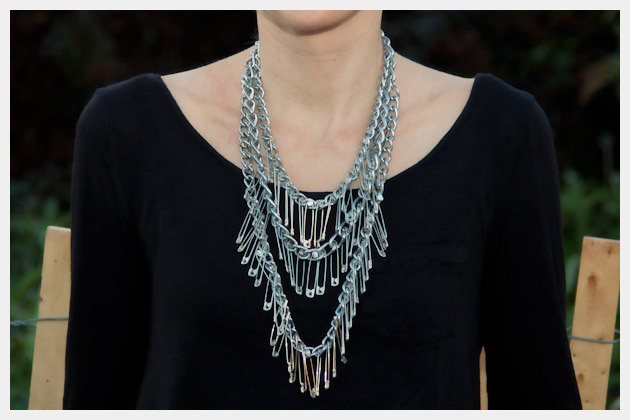 I know I will be wearing this triple chain statement necklace with everything! Its a great match for a basic Tee or sweater (or it will be, as soon as the weather cools)! Safety pins look cute with the rhinestones. 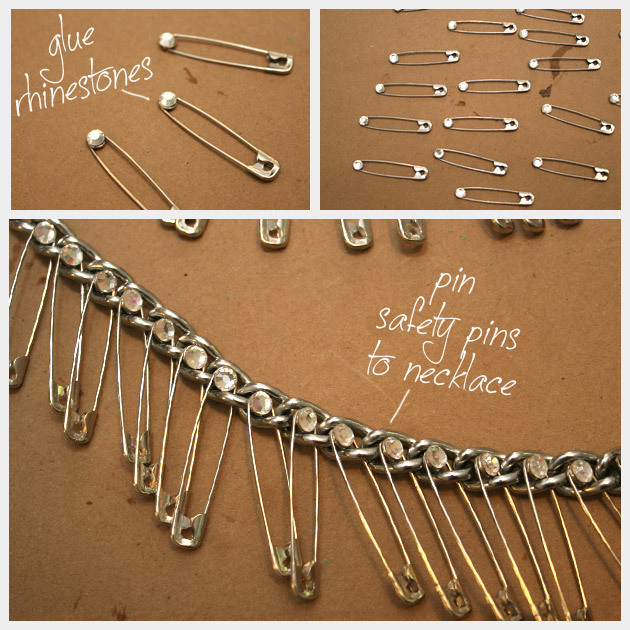 safety pins and this will be a great way to use them. Thank you for the idea. That’s a great idea, to add more rhinestones or mix up the colors. I think that would be really fun! This is such a cool necklace, and I think adding a couple rhinestones would be awesome!!!! I open recently a DIY fashion blog, let me know what you think about it!! You have some really great projects on your blog! I love how you show your inspiration and how to’s! AMAZING!!! 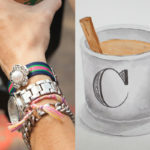 very simple DIY but the result is absolutely high fashion! The necklace is really a nifty idea. But, I had to read all through the directions in order to determine where you put the rhinestones. They just don’t show up well on the photo. 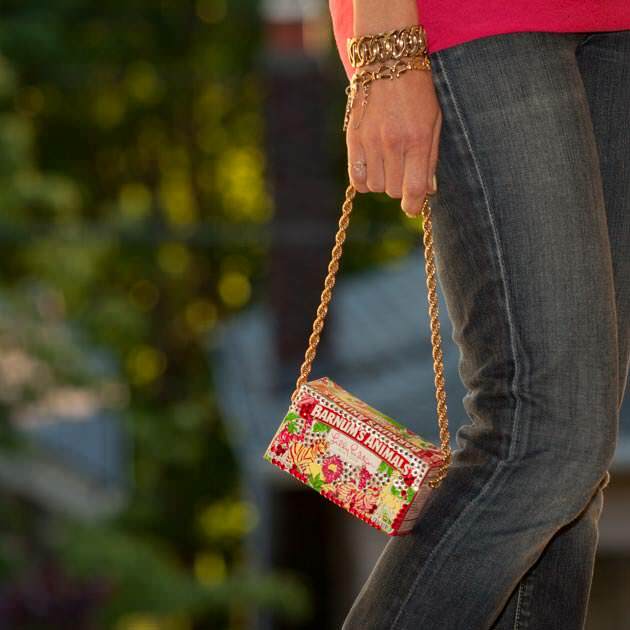 That said – I still want to try making one myself but maybe with colored rhinestones.